Tech Innovations in US Education #Infographic ~ Visualistan '+g+"
Education is considered to be the most promising area for the development and implementation of virtual and augmented reality technology. The idea of ​​applying virtual and augmented reality for the purpose of learning is far from being new, and VR (virtual reality) and AR (augmented reality) technology have long been used from virtual excursions in history or geography classes to learning how to control an airplane or a high-speed train. These new educational techniques allow to carry out the practical tasks more effectively as well as comprehend theory by the means of visualization. 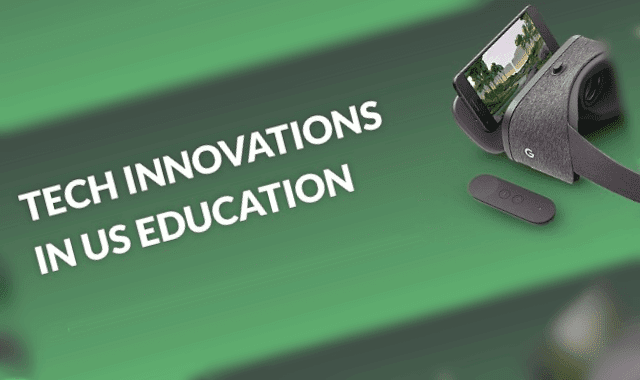 These new tech-ed innovations do not replace the conventional classroom lesson but supplement it with new possibilities, thus, enhancing the effectiveness of learning and acquisition of knowledge. Surveys conducted among educators show that most teachers think that the use of virtual reality can enhance the coursework in a variety of subjects. The most talked about ones are science, history and social studies.